Cory Terry Died After Drinking Red Bull, $85 Million Wrongful Death Suit Claims, is the title of a recent article in the Huffington Post that reports on a rather unusual death. Cory Terry downed a Red Bull when he finished a basketball game and a few minutes later he died of a heart attack. 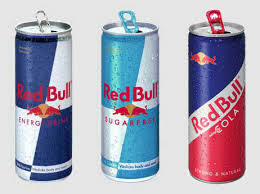 Red Bull comes in different formulations, the dark blue normal and a - supposedly more healthy - 'diet' or sugar free version, which is the light blue one. To be sure, we don't know which one Terry preferred. Was it the normal or the diet version that killed him? Betty Martini believes it was 'diet' and that the damage was done by a specific ingredient: the aspartame that supplants sugar in the diet version. Betty says she knows of other cases of athletes having heart attacks after consuming soft drinks that contain aspartame. She has been trying to alert press and authorities to the dangers of the methanol-containing sweetener. I am reproducing her lengthy email here because she goes into considerable detail. If you love diet drinks or know someone who does, read this or let them read it. The data might save your life. Another young man about the same age who played basketball several times a week, Charles Fleming, died and the hospital said it was methanol poisoning. This is common with aspartame. Dr. Roberts says aspartame is extremely addictive. The free methyl alcohol classified as a narcotic causes chronic methanol poisoning. This affects the dopamine system of the brain and causes the addiction. The chronic methanol poisoning was on his autopsy as well as cardiomegaly. The physician told his wife to call the police and she did and gave them the last thing he drank - Gatorade - where they had found methanol. When the movie "Sweet Misery: A Poisoned World" was being made, and Diane from prison is in it, I spoke to the detective. He said, "Diane Fleming is innocent but I was promoted and could not stop the indictment." Later a toxicologist studied the records and said the actual death was from the creatine. Several experts gave affidavits and said it was from aspartame. Today there has been more study and more opinion on the cause of death, but there is no doubt in my mind that if he had never used aspartame he would be alive today. Dr. Roberts explains in his medical text and articles, that aspartame causes an irregular heart rhythm and interacts with "all" cardiac medication. It damages the cardiac conduction system and causes sudden death. Aspartame damages the mitochondria or powerhouse of the cell and interacts with drugs and vaccines. Here is one of Dr Roberts articles in these reports on aspartame and sudden cardiac death. Now let's talk about the stimulants. Many may remember when the FDA took ephedra off the market when Steve Bechler (23 year old Baltimore Oriole pitcher) dropped dead in West Palm Beach. Dr. Roberts lived in West Palm Beach so he immediately called the medical examiner and asked him how many diet drinks was he using but the medical examiner didn't know. A later article explained because of his fluctuating weight he would fast one day and drink diet soda all day the next. Since Steve Bechler used some ephedra FDA gladly took it off the market. However, ephedra is perfectly safe. Who headed the ephedra association but the famed Dr. John Olney who with Attorney James Turner tried to prevent approval of aspartame and he studied the FDA records. Read the Ephedra Story here. I spoke to Dr. James Bowen about this case and he explained just like aspartame interacts with drugs and vaccines it could interact with ephedra, even though ephedra is safe and should be returned to the market. Athletes continue to die from aspartame. You may remember Flo Jo, the runner, and seen her running with a Diet Coke in hand. Aspartame is a seizure triggering drug proven by the manufacturer's own study, and four types of seizures are listed on the FDA's own report of 92 symptoms including death. Read it on my web site, www.mpwhi.com Her case is in Dr. Roberts medical text. She was running, Diet Coke in hand, and died of a grand mal seizure. Even student athletes have dropped dead. Will we ever know how many athletes aspartame has killed? When I was in Barcelona, Dr. Alemany who did the famous Trocho Study on aspartame, said, "Betty, aspartame will murder 200 million people!" Has it already? Here is Dr. Alemany's study showing aspartame embalms living tissue and damages DNA. When you damage DNA you can destroy humanity. The aspartame industry tried to character assassinate Dr. Alemany because they could not rebut his study and its conclusions. In 1986 the Community Nutrition Institute tried to have aspartame banned because so many had seizures and were going blind from the methanol. It was taken all the way to the Supreme Court but the aspartame industry has power. Just read the Aspartame Resource Guide below on how it got on the market after even the FDA revoked the petition for approval and tried to have the manufacturer indicted for fraud. I have even filed an 'imminent hazard amendment', which the FDA has a week or ten days to answer. This was in 2007 and they wrote me a letter and said they had more important things to do. Even 12 toxicologists wrote the FDA to remove it from the market because of all the studies showing it is a multipotential carcinogen. In 2009 FDA called me and when I said, "I lecture all over the world and people are sick and dying from aspartame." I was told, "So what, we have to depopulate." Recently, Coke has this campaign to convince the public aspartame is safe because their sales of diet Coke keep dropping. Look at the DVD in the Aspartame Resource Guide from the UK and notice they show me holding up Dr. Roberts medical text - 1000 pages! in front of probably 1000 stockholders of Coke when I addressed their CEO at a stockholder meeting. Coke was #1 of the National Soft Drink Association (now American Beverage) and wrote a 33 page protest against aspartame which is in the congressional record on a banner on my web site. They have always known how deadly it is. Their campaign is such a joke. I suspect a lot of their stockholders had questions noting if a product is safe physicians don't write medical texts on how it kills. Mission Possible has chapters in 43 countries and in 20 years you can be sure we have the facts around the world on aspartame. Today there are millions of hits with web sites, articles, studies and the facts. A big problem has been the front groups and trade organizations funded by the manufacturer and companies who use aspartame to convince the public this chemical poison is safe. There are so many cases. One attorney called when another woman died of methanol poisoning who used aspartame products. They had arrested her husband. Some years ago a man called who said he had an aspartame blackout and drove his car 6 blocks asleep and killed 3 people. He spent 5 years in prison. When is it going to stop? Dr. Roberts, world expert, died a few months ago, and he wanted so badly to see Diane Fleming released before his death. Look at the epidemics in this country so many wonder about, with huge medical bills. Take aspartame off the market and as Dr. James Bowen said, "the government could save billions if not a trillion dollars!" Aspartame medical text, Aspartame Disease: An Ignored Epidemic, www.sunsentpress.com by H. J. Roberts, M.D., over 1000 pages He also has other books on aspartame and "A Manifesto for American Medicine"
Dr. Leonard Coldwells Detox Formula. His new book is The Only Answer to Cancer. Goes into aspartame and cancer. While Science Sleeps by Dr. Woodrow Monte. Goes into the deadly free methyl alcohol in aspartame that converts to formaldehyde. You can get it at Amazon. Discusses diseases caused by the methanol like MS, blindness and birth defects. Tells how FDA made a deal with G. D. Searle to hide the studies that showed aspartame causes birth defects, so the public would never know. Explains autism epidemic. Aspartame Information List, you can subscribe on www.mpwhi.com scroll down to banners. How to get aspartame out of your state. Information on how aspartame blinds. Safe Sweetener: Just Like Sugar, www.justlikesugarinc.om Can be found in places like Whole Foods. Made of chicory and orange peel, Calcium and Vitamin C. Chicory has been used for 70 years to improve the health of diabetics. Dr. Russell Blaylock wrote in his newsletter, The Blaylock Wellness Report, www.russellblaylockmd.com "Finally a safe sweetener". You can go to their web site above and add your zip code and it will tell you where to get the product or you can get it on web itself. Be sure to try their marvelous hot chocolate with nothing but chocolate and vanilla bean and JLS. What a difference in the taste without a bunch of chemicals. Special warning for diabetics: Aspartame can precipitate diabetes, simulates and aggravates diabetic retinopathy and neuropathy, destroys the optic nerve, causes diabetics to go into convulsions, and even interacts with insulin. The free methyl alcohol causes diabetics to lose limbs. Jeanette Soto, Mission Possible Brookville, Florida who wrote Blinded Sight when her husband lost his sight from aspartame was unable to get her father-in-law, diabetic off aspartame because of the addiction. The free methyl alcohol is classified as a narcotic. It causes chronic methanol poisoning which affects the dopamine system of the brain and causes the addiction. When Jeanettes father-in-law, Santiago Echiverria died it had to be a closed casket, the formaldehyde from the free methyl alcohol was oozing out of his skin. The American Diabetes Assn was sued in 2004 for racketeering for pushing aspartame on diabetics, but because of their power got out of it. "Only after longer aspartame usage does liver damage cause blood methanol levels to measurably rise because the liver mitochondria are so damaged that the liver no longer quickly processes either methyl or ethyl (drink) alcohol. Then the acute methanol poisoning is directly measurable from lab results, as the blood methanol level elevates. This entire sequence or "toxic axis" begins with your very first dose of aspartame. Both acute and chronic poisonings from this methanol toxic axis, and other additive and synergistic aspartame poisonings, steadily accumulate in the aspartame consumer. We continue to get reports of people dying of methanol poisoning. Charles Fleming died and his wife, a Sunday School teacher, remains in a prison in Virginia. The detective on the case said, Diane is innocent but because I was promoted I could not stop the indictment. Be warned no diabetic should ever consume wood alcohol. The FDA did no NOAEL on methanol. Without it you cannot set an ADI, allowable daily intake. Its 44% too high. Here is how Splenda is made. Recently, Dr. Morando Soffritti announced a new study on Sucralose which showed it causes cancer. Ajinomoto announced a new name for aspartame called AminoSweet. Be warned. It goes under many names; NutraSweet, Equal, Spoonful, Naturataste, Canderel, Benevia, E951, etc. Because the patent has expired it can be used in anything. You must read labels. Many times its hidden in artificial and natural flavors. Remember that aspartame has a synergistic and additive effect with MSG. Stuart Pape of the National Yogurt Assn has petitioned the FDA to allow aspartame unlabeled in yogurt and dairy products. The FDA has ignored my FOIA request asking if they allowed this, which is illegal. Acesulfame Potassium (Sunette) triggered cancer and leukemia in original studies. Be warned that the FDA has been petitioned for the approval of another aspartame product, Advantame, already approved in Australia and by the European Food Safety Authority. Also, the dairy people have petitioned the FDA to allow less labeling in chocolate milk and 17 other dairy products. Protect your children! FDA must by law have a PKU warning for phenylketonurics who cant metabolize phenylalanine. Dr. James Bowen says that aspartame actually causes Phenylketonuria! Prestigious Ecologist: Aspartame was listed with the pentagon in an inventory for prospective biochemical warfare weapons submitted to Congress. In reading available information, I assume you want mostly how aspartame relates to cancer. Indeed it is a carcinogen, proven so by many scientific studies. Aspartame also triggers many other serious diseases, which fill the 1,000+ page medical text, Aspartame Disease: An Ignored Epidemic, www.sunsentpress.com by H. J. Roberts, M.D. Now I'll go back to the beginning. Searles problem was they couldnt get studies to show safety. For example, in the Bressler Report: http://www.mpwhi.com/aspartame_news.htm you read where they would excise brain tumors from the rats, put them back in the study and after they died resurrected them back on paper. They even filtered out neoplasms to hide them from the FDA. Repeatedly Searle was caught in this criminal activity. Searle was caught dead to rights, so they hired Skinner, made him a deal he couldnt refuse. So the former Justice Department prosecutor became a defender. Next at bat - U. S. Prosecutor William Conlon, promptly switched sides too. By then the statute of limitations had expired. Searle knew they couldn't win the case so they simply hired the prosecutors. The Godfather hired the District Attorneys! Nevertheless the FDA had no intention of approving aspartame. The fraud was so great that Dr. John Olney (who with James Turner fought against approval of aspartame) told Searle to do studies in his lab so he could see that they were done honestly, with supervision. Dr. Olney believed the FDA wouldnt approve aspartame because the studies showed it produced brain damaged. What he didnt anticipate is that Searle didnt submit these findings to the FDA. January 30, 1980 the Public Board of Inquiry revoked Searles petition for approval declaring that they had "not been presented with proof of reasonable certainty that aspartame is safe for use as a food additive." Searle had spent $17 million on an aspartame factory and had no intention of giving up, poison or no. At this point they hired Donald Rumsfeld who said he would call in his markers and get it approved anyway. What were those markers? President Reagan had told Rumsfeld he would be nominated for vice president, but instead selected Bush number 1. Once aspartame was on the market there was outrage as consumers were diagnosed with seizures, multiple sclerosis and blindness from the free methyl alcohol releases. Senator Orrin Hatch, on Monsantos payroll, obstructed hearings on aspartame for years, but there were 3 Congressional hearings from 1985 to l987. Hatch was on Monsantos payroll, and kept the bill in committee that would put a moratorium on aspartame until NIH completed independent studies on the flood of aspartame problems they were seeing: seizures, blindness, headaches, sexual dysfunction, behavioral problems, especially in children, drug interactions and birth defects. About that time Dr. James Bowen wrote FDA that aspartame is mass poisoning of the American public and 70 countries - today over 100. http://www.dorway.com/drbowen.txt The good doctor wrote: "For this reason, I am opposed to labeling aspartame content of food and drinks. To do so would imply that the government is taking some sort of responsible action....when the only responsible action would be to immediately take aspartame off the market, fully disclose its toxicities, offer full compensation to the injured, public and criminally prosecute anyone who participated in the fraudulent placement of aspartame on the marketplace." How was the new FDA Commissioner, Arthur Hayes, rewarded for over-ruling the Board of Inquiry? He was hired as a consultant to NutraSweets PR Agency on a 10-year contract at $1,000.00 a day, and nobodys heard a peep from him since, he got lockjaw. Who ever heard of a PR guy who wont talk? Now they began funding professional organizations, ladies-of-the-evening like the American Diabetes Assn, American Dietetic Assn and numerous others to propagandize the public with touting asparshame. Of course they also threatened scientists whose studies identified the toxicity of this poison. In the UPI Investigation Dr. Wurtman was threatened if he did studies on aspartame and seizures he would lose his funding. He capitulated. Read this report on the 8 month investigation by United Press International: http://www.mpwhi.com/upi_1987_aspartame_report.pdf Dr. Wurtman, too, got a terrible case of aspartame lockjaw, but MIT still gets the money. ILSI, the International Life Sciences Institute, was born in 1978 as a research front for our favorite poisoners. Its board members are from Coke, Pepsi, Searle, Monsanto and the rest of the usual suspects. If a university won't play their way the get no pay, that is to say, funding for fake research. Consider seizure studies by Monsanto, they bought Searle in l985: http://www.holisticmed.com/aspartame/abuse/seizures.html Seizures are listed 5 times on the FDA report of 92 symptoms that range from male sexual dysfunction to death: http://www.mpwhi.com/92_aspartame_symptoms.pdf People are having so many seizures and going blind on aspartame that the Community Nutrition Institute filed a petition to ban aspartame in l986. Again the manufacturers put in the fix to prevent it from being banned. They were so worried someone would have a seizure they actually gave people anti-seizure medication in the Rowan study. This impeccable study involved one-day consumption of, believe it or not: a single capsule of aspartame. Tantamount to smelling the bottle. The got it peer reviewed with their power. So when consumers complain of seizures they say "we did studies and aspartame doesn't cause seizures". I smoked a Lucky once and Im fine, so nicotine doesnt cause cancer! When 60 Minutes did a story about aspartame and brain tumors the manufactures claimed to have all these studies showing safety. Dr. Ralph Walton who was on the show decided to research who funded the studies: http://www.dorway.com/peerrev.html Note that 92% of independent peer-reviewed studies show problems aspartame causes, while those funded or controlled by industry all say its safe. If you eliminate 6 studies the FDA, aspartames branch office in Washington, messed with, and one pro-aspartame sponsored summary, 100% of independent scientific peer reviewed studies show aspartame problems. As Dr. Bowen said: this is mass poisoning of the world. Aspartame destroys the brain, the optic nerve, the immune system and central nervous system. It devastates every organ of the body. Epidemic obesity, diabetes, sexual dysfunction, retinopathy and neuropathy, optic nerve destruction, convulsions and insulin reactions, MS, Parkinsons, Alzheimers, IQ depreciation and dozens of other afflictions have been inflicted upon us by this deadly neurotoxic carcinogenic sweetener. Another study by Dr. Morando Soffritti, Ramazzini Institute, showed aspartame causes liver and lung cancer. A detox formula for aspartame victims endorsed by Dr. Russell Blaylock, Neurosurgeon: www.wnho.net.wtdaspartame.htm Available are his excellent books and a CD :"The Truth About Aspartame"
There are efforts now in states and countries to rid the planet of aspartame. It is genetically engineered. The manufacturers are get people in high places addicted. When I testified to the Senate in New Mexico, half the senators were sipping Diet Coke. Presidents Clinton and Bush were addicted. Methanol is classified as a narcotic and it causes chronic methanol poisoning. This affects the dopamine system of the brain producing addiction. Consumer power is winning the war against this toxin. Holland Sweetener, the largest European aspartame producer closed in 2006. Another European maker also quit. In Japan Tosh stopped making it as well. Merisant, in the USA went bankrupt for $230,000,000 in January, 2009. 47 members of Parliament signed for a ban in the UK. There is continuing effort to get banned in the Philippines. Romania banned it in the early 90's because its carcinogenic. And now the European Food Safety Authority is doing a review. If I can provide further data Ill gladly do so. There is no way to show safety on aspartame with honest, unbiased studies. Eliminate industry studies to defend its product and you'll see how deadly is this toxin. Dr. Bill Deagle said its more deadly than depleted uranium because its ubiquitous in our food.